It may seem like a landlord has nothing to lose by tossing every provision imaginable into the lease agreement, or creating a one-sided lease that offers the most benefit possible for the landlord. Yet, when it comes to lease drafting, there is danger in throwing in the kitchen sink. If a provision turns out to be illegal, at the very least the landlord will not be able to enforce it. But what’s worse, under some circumstances, the bad provision will invalidate the entire lease. These days it is as easy to buy a lease agreement as it is a pack of light bulbs. But those unchecked leases may have some problems, especially if a landlord adds in custom provisions which don’t comply with local law. Whatever lease form a landlord chooses to use, it should be reviewed by an attorney before it is turned over to a tenant. 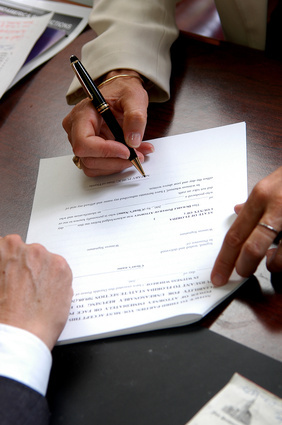 Provisions which hamper a tenant from exercising their legal rights. If a lease provides that a tenant cannot defend an eviction, or allows the landlord to evict without notice, the provisions are likely illegal. Occupancy rules are a headache because they can change from time to time, or the standards listed in the lease may conflict with the law. If these provisions are included in a lease agreement, a lawyer may want to make sure they are not more restrictive than local law. For instance, it is usually an acceptable occupancy standard to allow two people in a one-bedroom or studio apartment. These occupancy rules include the need to deal with new occupants — subletting, assignment of the lease, roommates and guests. Judges don’t favor rules restricting a tenant’s contract rights so these rules must be worded very carefully. If a provision is too strict, it could be thrown out–and then the landlord has no protections. The landlord may be better served by going easier on the rules but demanding the right to run a tenant background check on new occupants. Reserving the right to evict a tenant over a crime committed at the rental property can also be a delicate balance. For instance, a provision in the lease which allows a landlord to toss a tenant when a guest commits a crime may violate the protections recently passed for domestic violence victims. The lease may require conviction of the crime, which could take months, while the other tenants are threatening to leave. Alternatively, if the tenant has not been convicted, the landlord may have to prove the tenant committed a crime. These provisions should be as strict as local laws allow. Lease termination fees which allow a landlord to double-dip if the lease-breaker’s apartment is rented out quickly could be a problem. Many times these provisions are illegal because the landlord has the duty to use best efforts to re-rent the property, and the former tenant is not liable for rent beyond the point of new occupancy. Attorneys fees are another tricky matter with many states requiring that the prevailing party, not just the landlord, be entitled to attorneys fees. Some states ban the provisions altogether. Even if the attorneys fees provision is allowed it may be of little value if it is written in such a way that it only applies if there is an actual trial. Many cases settle prior to trial. Restricting a tenant’s ability to sue the landlord for conditions on the property are generally not allowed. The same is true for an agreement that the landlord is not liable if the property falls into disrepair, or if the tenant is required to perform or pay for routine repairs that are actually the duty of the landlord. This may be true even if the tenant suggested the arrangement. Occasionally a residential landlord will borrow language from retail or commercial leases, like a due on demand clause or an acceleration clause that requires a tenant to pay the remainder of the lease in a lump sum. These provisions generally are not allowed in a residential lease. Once you have chosen a lease agreement that you would like to use, have a local landlord-tenant attorney review it and eliminate problem provisions. In all likelihood, this will save a landlord money in the end. Previous post: Do You Have What It Takes to Evict a Problem Tenant?